Mammography depends on the degree of absorption of X-rays by cancerous tissues compared to the surrounding adipose and glandular tissues. When there are large areas of dense fibroglandular structures, the contrast between a tumour and healthy tissue is low, making the diagnosis of cancer difficult. One method of enhancing the contrast is to inject a contrast agent such as iodine into the bloodstream and then to take two mammograms, in rapid succession, at different energy levels. Since the contrast agent accumulates preferentially in lesions that are metabolically active, the cancerous tumour can be revealed by digitally subtracting one image from the other (see images at right). 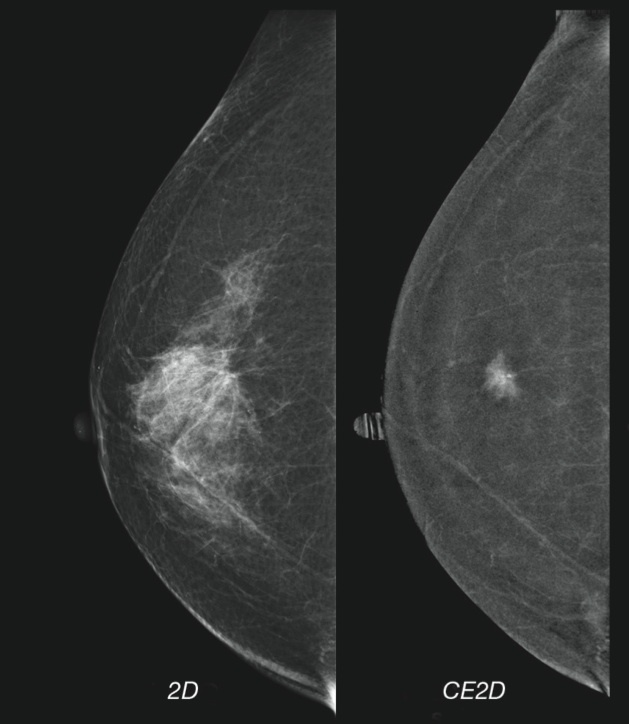 However, there are two drawbacks: first, patients can have an adverse reaction to the contrast agent; and second, the patients are exposed to 50% higher radiation dose compared with a standard mammogram. At the recent RSNA meeting held in Chicago at the beginning of December, Marco Stampanoni from Switzerland presented a paper entitled “Non-invasive classification of microcalcifications with phase-contrast X-ray mammography.” In this technique, there is no necessity to inject a contrast agent; instead, the researchers use a series of interferometric gratings to perform phase-contrast imaging. The scientists, who work at the Paul Scherrer Institute where the focus is on materials, energy and human health, described their technique earlier this year in Nature Communications. Microcalcifications, which are calcium deposits often found in areas of accelerated cell turnover, can be an indicator of pre-cancerous changes in breast tissue. 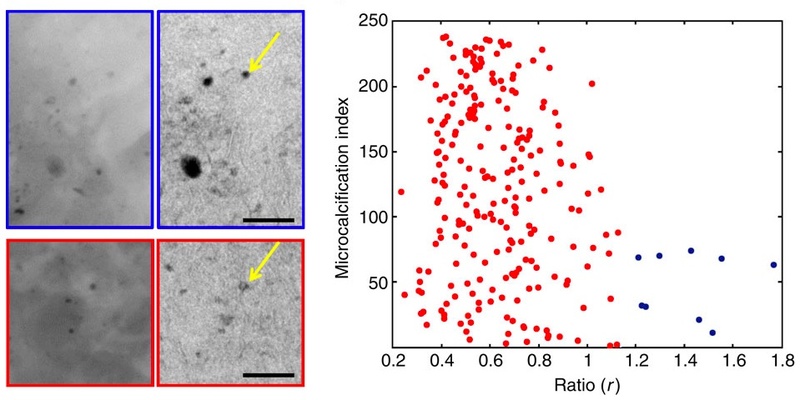 There are two types of microcalcification – type I and type II – where each has different absorption and scattering properties, as well as different chemical compositions. Since type I microcalcifications are indicative of benign lesions whilst type II are associated with malignant lesions, the challenge is to distinguish between the two types. That’s where phase-contrast mammography comes into its own. Type I micro-calcifications (blue) contrasted with type II (red). © Nature Communications. As Stampanoni explained, “By considering the small-angle scattering signal as complementary to the absorption signal, our method can analyse the difference in the attenuation coefficient as well as in scattering power of the microcalcifications to decouple the thickness parameter.” He and his team have studied both whole-breast samples as well as breast biopsies and have demonstrated excellent sensitivity and specificity in distinguishing between the two types of microcalcification (see images above left). Next, they plan to test their technology in a clinical trial, with in vivo imaging, and hope to improve early diagnosis and reduce unnecessary biopsies. If successful, that would be a significant achievement. Interesting but still a long way to go. What will happen in perfused tissue? 9 seconds exposure time. Movement? But is is image fusion! And that is nice.